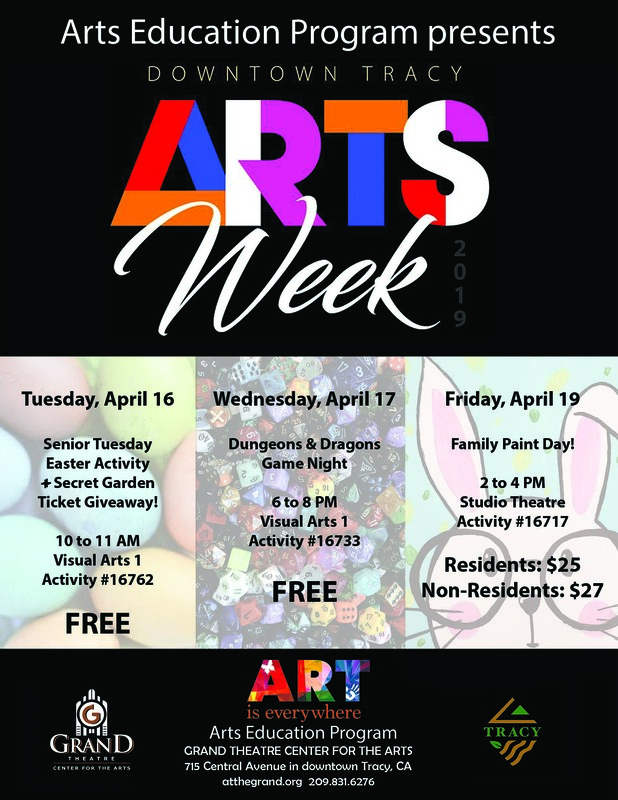 Join the Arts Education Program for Downtown Tracy’s Arts Week! On Tuesday, April 16th we will have a special Easter craft and ticket giveaway exclusive for adults ages 50 and up as part of our Senior Tuesdays at the Grand. Join us from 10 AM to 11 AM for this FREE craft followed by a drawing for Secret Garden tickets! On Wednesday, April 17th join us for a Dungeons and Dragons Game Night! From 6 to 8 PM participants will learn the basics of this role-playing game, pick their character, and work as a team to accomplish tasks and solve problems that may come up in the game. Open to all ages. Participants 12 years or younger must be accompanied by an adult. On Friday, April 19th we will be hosting a Family Paint Night! This painting activity is perfect for the start of Spring Break. Participants will follow step-by-step instructions to paint a bunny. Sign up now!